If you read my first article Eat Your Vegetables then thank you. The responses I received were tremendous and motivated me to continue writing. In particular, I received a significant amount of responses about the skills of Strength, Toughness, Optimism, Mentality, and Preparation (STOMP). Therefore, I am introducing a mini-series that addresses each of these concepts in depth. Particularly, I will address how each of these concepts enhances golf performance. Buckle up, by the end of this article you will be stronger! When I talk about strength I am not focusing on muscle development or a physical concept. Rather, I am referring to the ability to focus on and adapt to taxing situations during competition that ultimately improve golfing performance. Too often golfers let a situation define their outcome. One bad experience on a hole, or an entire golf course for that matter, becomes a golfer’s identity. For example, if you are an avid golfer you have probably played with someone that identifies with a certain type of shot or score. They might indicate they always slice the ball so they play for the slice. Another instance is when a golfer implies they are a ‘bogey’ golfer. It is as if golfers have fixated on being someone who makes the same mistakes and now those mistakes are their identity. Strength allows golfers to realize this weakness and they can change it through psychological means. Psychologically, it comes down to cognitive appraisal. Over time golfers appraise taxing situations as harmful and threatening to their golfing existence. This produces anxiety which affects golfing outcomes greatly. Let’s look at an example. Remember the slicer? Since they slice the ball they might get a little uneasy when there is a hazard, out of bounds, our houses on the right side of the hole (if they are a right-handed golfer). This may cause them to aim a little further left and maybe even hit the ball straight! However, since they are aimed so far left the straight ball now ends up in a penalizing position. The straight shot should be one that was rewarded, but since their patented slice failed them the straight shot is now viewed as an undesirable shot. Simply put, when golfers appraise an emotionally arousing (get your mind out of the gutter) situation as threatening or harmful their outcome will likely be poor. However, there is a third alternative embedded within cognitive appraisal. This is the much more productive alternative known as challenge. 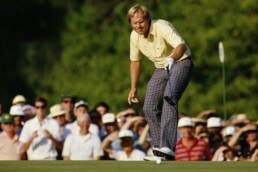 When a taxing situation is viewed as a challenge then the golfer can achieve mastery. 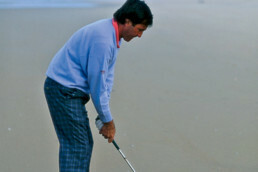 Rather than focusing on the hazard or out of bounds, the golfer focuses where they would actually like to land the ball. 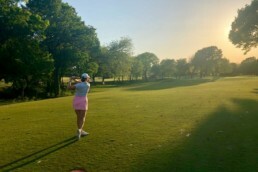 Visualizing a positive outcome allows the golfer to cognitively reappraise the situation, calm any anxiety, and now stand a much better chance to produce a wanted shot. When a golfer views a tough hole as a challenge they develop a strong mindset for the game and they learn that they do not have to identify with being an average or poor golfer. Another way in which a golfer can make gains in mental strength is by changing their mindset towards how they play and practice golf. Remember the golfer who identifies with being bad? They fixate on what they do wrong and then they accept it as how they play golf. In psychology, we call this a fixed-mindset. When a person has a fixed-mindset they believe their traits and talent are fixed and they cannot improve. In fact, the fixed-mindset golfer will blame the wind, course conditions, their right shoe was tied too tight, or anything they can think of for their bad round. They will not blame their self for their lack of preparation or for their consistently poor performances. In other words, they justify why they are a bad golfer. However, a golfer with a growth-mindset is much more likely to achieve mastery and see improvement. Carol Dweck posits a growth-mindset allows for individuals to enjoy a challenge, learn from mistakes, and do things that are difficult. The growth-mindset allows golfers to reach levels of performance that they never thought they were capable of reaching. Let’s dig deeper into the growth-mindset. Golfers often want to play well, but they don’t use efficiency to get better. Instead, they use their fixed-mindset to play a round of golf which usually produces similar results every time they play. Approaching the game with a growth-mindset allows the golfer to learn from their experiences in order to improve. Need an example? I thought you would never ask! Practice is something the vast majority of golfers do not use to their advantage. I would venture to say that the average golfer’s practice consists of a brief warm-up right before their tee time. With a growth-mindset, a golfer can view practice as a challenge. Give it a shot yourself. Visualize that shot that gives you trouble on the course and go practice it. Better yet, get a lesson from a PGA Professional and integrate your new found mental strength into what you have learned. Now you are using your time efficiently and getting better in the process. In a psychological context, strength allows the golfer to adapt and focus on taxing situations as challenges rather than a threat or harm. If you think about it that just seems simple. Why would we let certain aspects of a game become part of our identity? Why would we let it ruin our day? Golfers need to start changing their mindset to enjoy golf once again and to realize that everyone has the ability to improve. I understand that it is easier said than done, but developing mental strength will enhance your golfing performance. Try viewing golf as a challenge and watch as your game steadily gets stronger.